The brewer has been named Creative Marketer of the Year at Cannes for a second time. Kate Magee examines the creative methodology behind its success and some of the ads this approach has spawned. Can you get an entire company to understand what a great creative campaign looks like? That’s the conundrum Heineken has been attempting to solve for the past year. The brewer, well-known for taking an innovative approach to marketing over its 150-year history, has designed a creative measuring scale that staff are being taught how to use. By doing so, Heineken hopes to break down any resistance to discussing creativity and help improve its work. Heineken has been rewarded for its efforts at this year’s Cannes Lions festival, becoming only the second company to twice be awarded the top honour for a client – Creative Marketer of the Year. The Lions Festivals chief executive, Philip Thomas, says Heineken "has consistently proved it is creatively brave and that it understands and believes in creativity as a business driver". Søren Hagh, Heineken’s executive director of global marketing, says the brewer believes that creativity is fundamental to the business, and this is an attitude that comes from the very top of the company, which is still majority family-owned. The reason is a pragmatic one. "We believe in brewing truly good beer," Hagh says. "We don’t compromise and we don’t cut corners, so we’ll never be the cheapest. But if you commit to truly great products, then you need to find truly great ways of telling that story to consumers and to prove these products are worth paying more for." Hagh also argues that creativity is even more important in today’s fragmented media environment because Heineken is no longer just competing for consumer attention with other brewers or advertisers, but with people such as Barack Obama and Lady Gaga. Social media is indeed a great leveller. Heineken realised that to make its work "even better", it needed to make staff feel comfortable talking about creativity. "People have different interpretations of what it is," Hagh says. "There can be misunderstanding and people shy away from discussions around it." To counter this, the company has introduced a common language around creativity to make people more willing to debate it. A "creative ladder", which categorises campaigns on to different rungs, has also been designed. A campaign that is on the first rung actively harms a brand. One on level four just replicates the advertising norms of the category. And work that reaches level ten "is so brilliant, it will be remembered when we’re all dead". All of Heineken’s campaigns must be at least at level five, which means activity that is unique, differentiating and could only have come from its brands. This is being taught to employees and agency partners around the world. It supplements an existing programme that enrols executives on a mandatory training programme in sales and marketing. Their performance on the course is linked to promotions. Creativity will become a criterion in the company’s recruitment programmes. Heineken also has a creative counsel, comprising a mix of the best internal marketers and its agencies’ creative directors. "They make sure we’re not drinking our own Kool-Aid," Hagh says. It’s a refreshingly serious approach to the business of creativity. Let’s hope other companies reach the same place. #Sharethesofa was the first weekly football programme created specifically for the second screen. Viewers could tune into and interact with the show (which had Heineken branding) while watching a live match. It was hosted by footballers including Ruud van Nistelrooy, Owen Hargreaves and Hernan Crespo. Newcastle Brown Ale says it cannot afford to buy an ad slot during the Super Bowl. So, last year, it created an integrated campaign that showed what it would have made if it had $4.5 million going spare. It released trailers, teasers, a storyboard of the ad and behind-the-scenes videos with the stars who would have been in it. This year, it decided to team up with other brands to split the cost. Two weeks before the game, the Parks And Recreation star Aubrey Plaza asked brands to join in an online film launch. A record 37 brands ended up being packed into a 60-second slot. Tecate released a series of amusing ads ahead of the World Cup. They showed men acting romantically to women, but only in order to watch the football. In one spot, a man tells his date he shouldn’t go back to her apartment because he wants them to have a long-term relationship, but what he is really concerned about is missing the match. This campaign urges people to challenge conventions. It features stories of people who have taken an unusual path, including a tattooist from Hong Kong, a stuntman, a parkour runner and a Chinese visual artist. To promote the Kiwi beer brand Tui, Heineken set up a cricket competition called "Catch a Million". Entrants had to wear a Tui-branded T-shirt and lanyard, and try to catch a ball that had gone for six one-handed, live on TV. Those who succeeded won 100,000 New Zealand dollars. As a result, Tui beer sales reached a two-year high. Primus, a mainstream beer brand, wanted to inspire people to connect to build a better future. 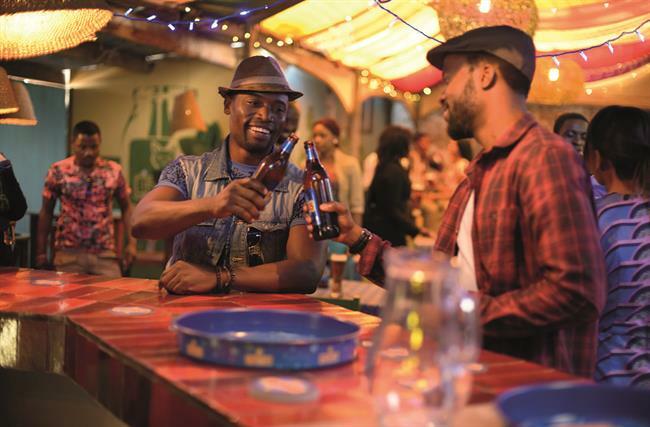 Each ad in this campaign shows a group of people enjoying a beer together, sharing their experiences and coming up with unexpected business ideas.